Studio Shed makes prefab sheds and garages that can be setup quickly and used as a backyard shed, studio, garage, backyard home office. Kits start at $1,700 (check their website for current prices) and you can even configure your custom shed online and view pricing instantly. You’ll probably find that to get a habitable structure you’ll pay $10,000+. Studio Shed is located in Boulder, Colorado but they ship their sheds across the US. They use sustainable FSC certified dimensional lumber, recycled aluminum windows, and low-VOC paint. Several colors are available and sizes range from 8′ by 8′ to 12′ by 30′. While you might be able to build a simple shed like this for less money they offer a lot of value in the speedy installation and high quality finish. I can see do-it-yourselfers choosing to take the custom built route to save a few bucks but this looks like an incredible option for those looking for a more turn-key option. I first spotted this on Jetson Green. Photo credit to Studio Shed. This entry was posted in Kits / Prefab and tagged backyard, green, home office, kit, Shed Kit, Studio Shed, sustainable architecture. I like the modernist feel of the glass in this. Went to the Studio Shed site, and realized that the only thing under $2000 was a 3X8 shed (not quite house sized unless you only have a bed in there, I guess). I love the aesthetic of these, but a bit out of my price range. I’ll update the post to make that more clear. Thanks for the comment. 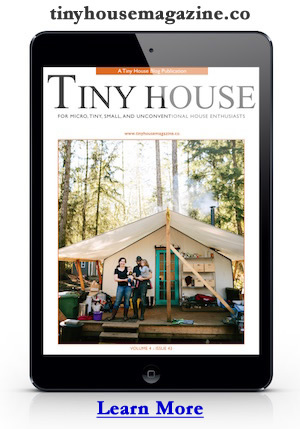 I love the idea that so many “boutique builders” have taken up the “Tiny House” banner. The amazing thing is that we’re doing this with 20′ ISBUs for less money. Finish is whatever your budget allows, but if you took a 20′ box and then hauled it down to the river, all you’d need is to install a set of French paned Doors in the side and you’d have your basic shelter ready for insulation in ONE DAY. Replace the pesticide ridden decking with new plywood flooring. Shoot SPF onto the outside of the box (or use rigid insulation panels that can be bought “salvage” from places like “repurposedMaterials” in Denver) and side it with rough cut lumber or even hardiplank and you have a really strong box that you can fit out as your budget allows. You can do all this for less than $9 grand easy. And best of all, except for the French Door install… you can pretty much do it yourself using basic tools. Let me begin by saying I did a lot of research before deciding to go with studio-shed for this project, and even though the product was a bit more expensive than the other options I found, I was won over by apparent quality of the design. Boy was I wrong! I write this to help people avoid the expensive mistake we made. Problems began with delivery. Studio-shed had promised they could delivery to our house. We made preparation accordingly only to find out a few days before delivery that they had changed their delivery system and that we would need to rent a vehicle to meet a semi trailer somewhere along I-5, which forced us to scramble and pay more to get the appropriate truck to transfer the materials to my house. Once we began building the problems really started to pile up. As we unpacked the delivery we realized that pieces were missing. We spoke with studio-shed and they promised to get us those pieces within the week. That didn’t happen. Fortunately, these parts were not needed until later in the building process so we were able to begin building. In the process of building we started to see some odd inconsistencies in the CAD drawings. Now, to be clear, we did NOT build this on our own. We had a licensed contractor with extensive experience with both CAD drawings and construction helping us, and even he could not figure out these CAD drawings. It turned out that he couldn’t figure them out because they were wrong. There were several major errors in the CAD drawings that Studio-Shed sent us. These errors cost us both time and money to fix. Throughout this process Studio-shed was difficult to work with, originally dismissing the errors as minor and then begrudgingly admitting they were significant. Unfortunately, these problems have turned out to be minor in comparison to what has recently emerged. You see, one of the reasons we went with studio shed was because we loved the look of the outer design, with the large rectangles and exposed metal. What we didn’t realize and Studio-shed doesn’t want you to know is that if it rains where you live water will get under those tiles, eventually breeding mold. This is why every type of house siding has overlap: to keep water from infiltrating and breeding mold. We have communicated these problems to Studio-shed and they originally seemed willing to work with us, but about 5 months ago they stopped responding to our emails. It is amazing to us that a company with their reputation would actually “ghost” a client, but that is exactly what has happened. Unfortunately, I cannot recommend highly enough that you stay away from Studio-shed. I hope this review helps others avoid the mistake we made. Thanks for the heads-up. Studio-shed was under very strong consideration for a prefab desert dwelling. Not anymore. Your feedback is invaluable – especially the bit about the rain problems (I loved that design too). Thanks for the review M Reyes – I looked at their install instructions and saw the cement board was attached directly to the Zip System sheathing and wondered the same thing regarding mold. Looks like a rain screen in the designs but is not. Their “plank” options seem to be a better approach to keeping the sub-structure dry, so despite your install issues, using the plank approach should solve your mold issue. By chance are you in the Seattle area? (you mentioned I-5 and I’m looking for a local install to look at). Am also wondering how their aluminum windows cladding is holding up? Amazing what a well designed web site will lead one to believe. Thanks for sharing (M Reyes) your hands on experience with these over priced sheds. I will look for other options.